Yesterday’s post was regarding a pre-pasted wallpaper. A lot of my colleagues scoff at pre-pasted papers, because they are lower-priced and because they are targeted to the DIY crowd. But I like them! 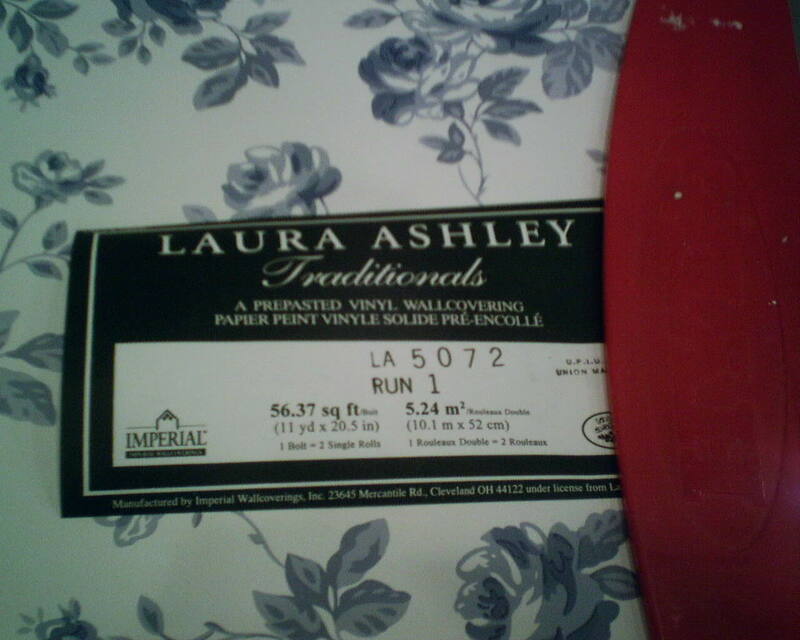 As long as they are paper or the newer non-woven materials (and not vinyl, which is horrible low-end stuff! ), I think they are fabulous products, as well as much faster to apply. Please read yesterday’s post for more reasons why I like these papers. In the photo, you see the water tray I use. I roll the strip up and run it through the water to activate the thin layer of paste which the manufacturer has applied to the back. As the paper comes out of the water, I fold the pasted sides together – this is called booking. The paper is set aside for a few minutes so the paste can activate, the paper can absorb moisture and expand, and to let excess water can drain off. 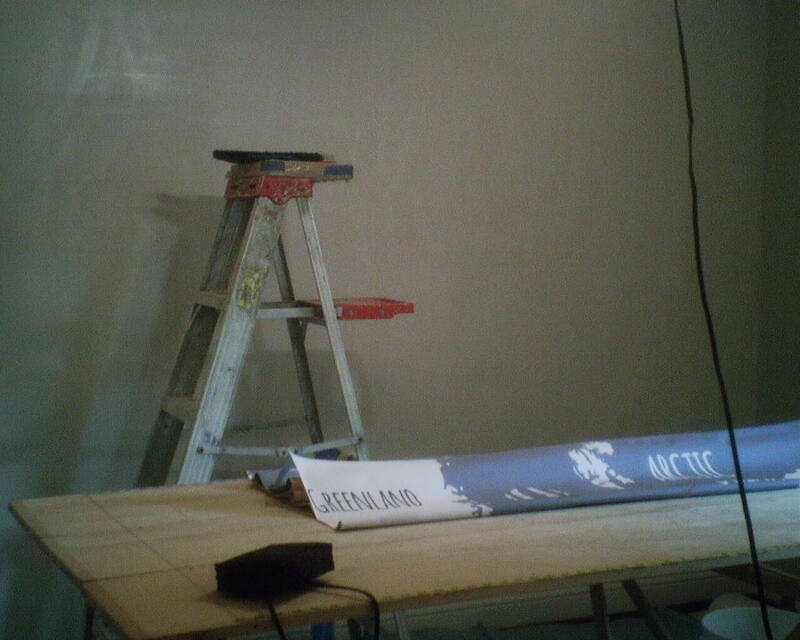 Then the paper is applied to the wall. Because a lot of water comes in contact with the surface, it’s important to wipe the surface completely, and to rinse your cloths frequently. Today’s job was challenging and tedious, but a whole lot of fun. The homeowners worked in the oil patch, and love these seismic charts. Some show places they have worked, and one even shows the family property! 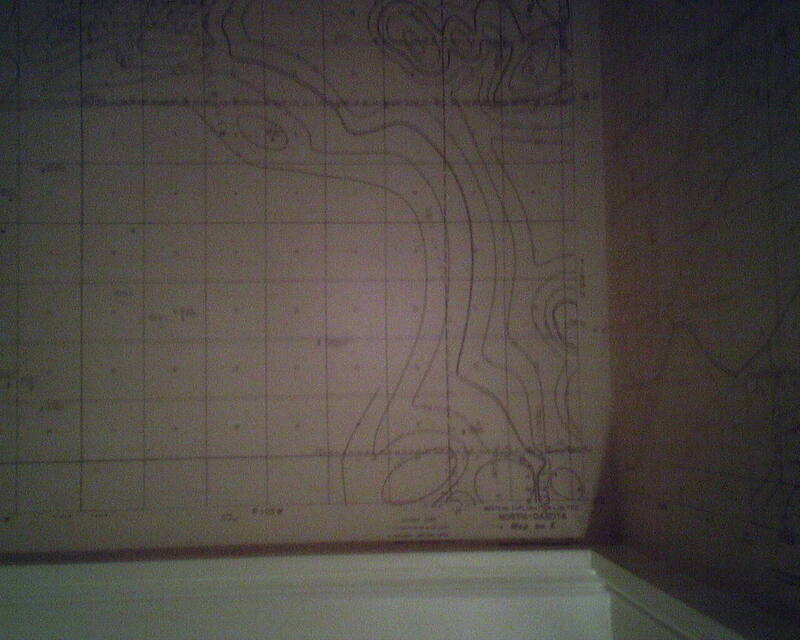 They wanted the maps to cover the walls above the wainscoting in their powder room, in a large Victorian 1904 house in Montrose (Houston). 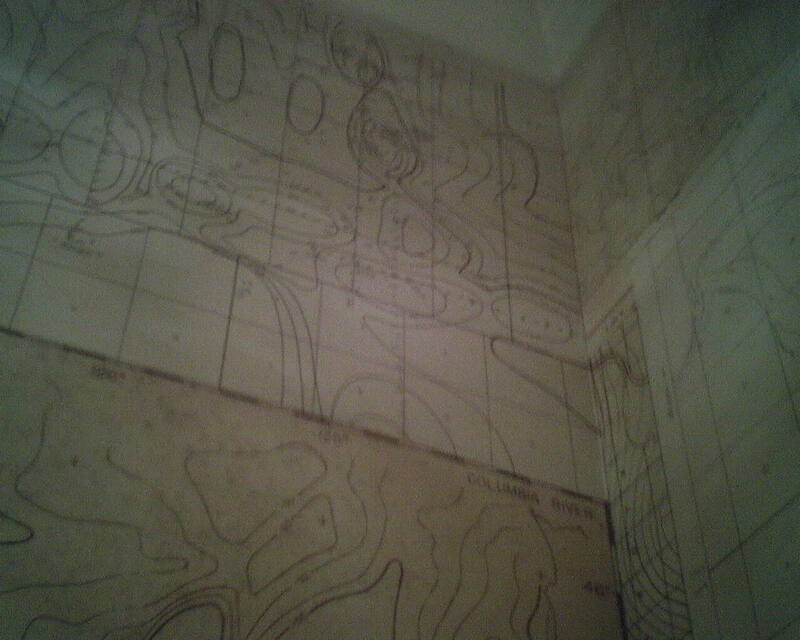 These were real maps, not wallpaper, so I had concerns about what adhesive to use, whether the material would tear when it became wet with paste, if a razor blade would cut it – or shred it, how much it would expand when wet, whether it would shrink when dry, and if ink marks on the paper (both printed and hand-written) would bleed. 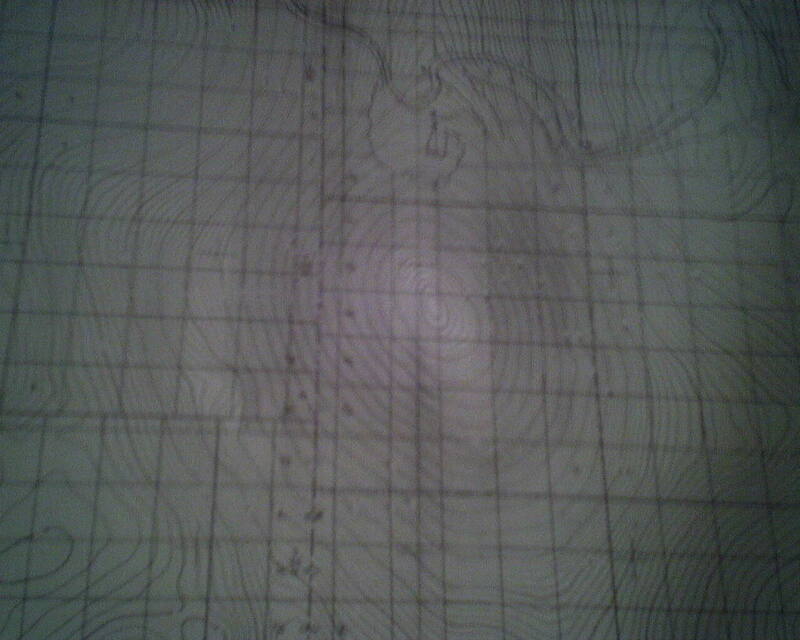 The homeowners provided me with a stack of maps to experiment with. 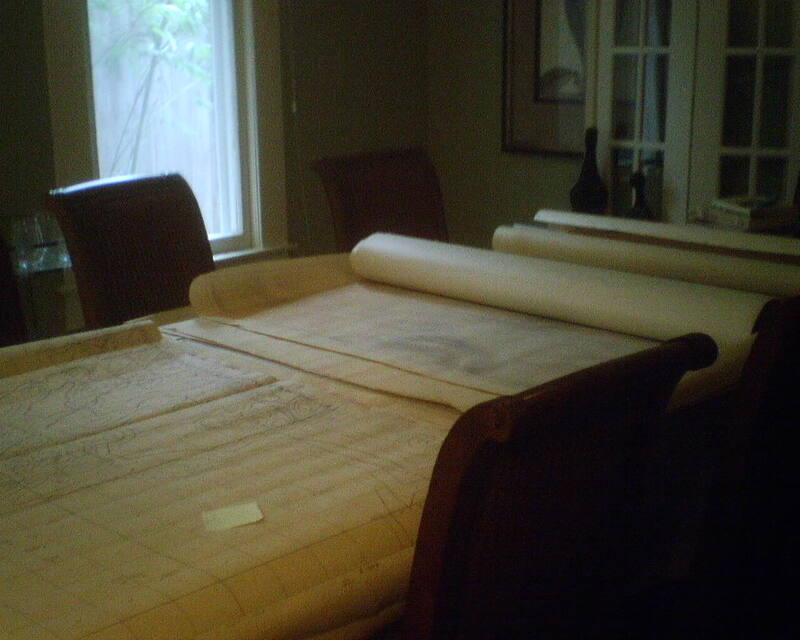 In the first photo, the maps are spread out on the dining room table, with the maps most important to them on the left, the maps with moderately significant features in the middle, and then a whole stack of maps that could be cut up to use as filler. They had worked out a few diagrams of where they wanted certain features, and also put yellow sticky paper with notations on the maps. In addition, the homeowner and I spent a lot of time talking about the various elements of the maps and what features were most important to the couple, placement, expectations, feasibility, etc. 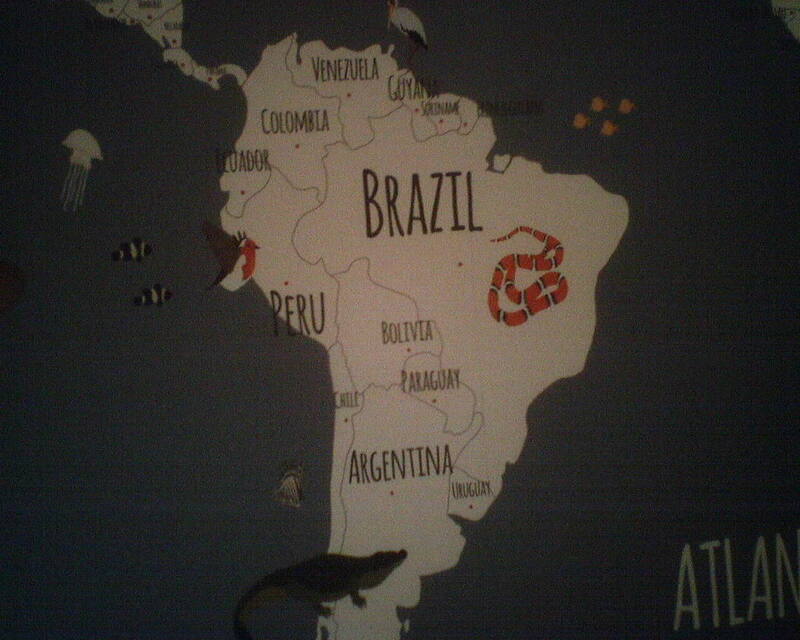 Keeping their wants in mind, I plotted out where to place the various maps. It’s more complicated than it sounds, because they were not all the same size (in neither length nor width), the dimensions of the walls had to be taken into consideration, filler material had to be cut to bridge gaps, and “more interesting” sections had to be placed in prominent areas (the family estate went on the back wall – the first wall you see when you walk in). Some of the maps were very similar, and I thought the walls looked better when there was something dividing the patterns, so I cut 2″ wide strips of filler (choosing material that had a contrasting pattern) to place between maps. You can see this in some of the photos. 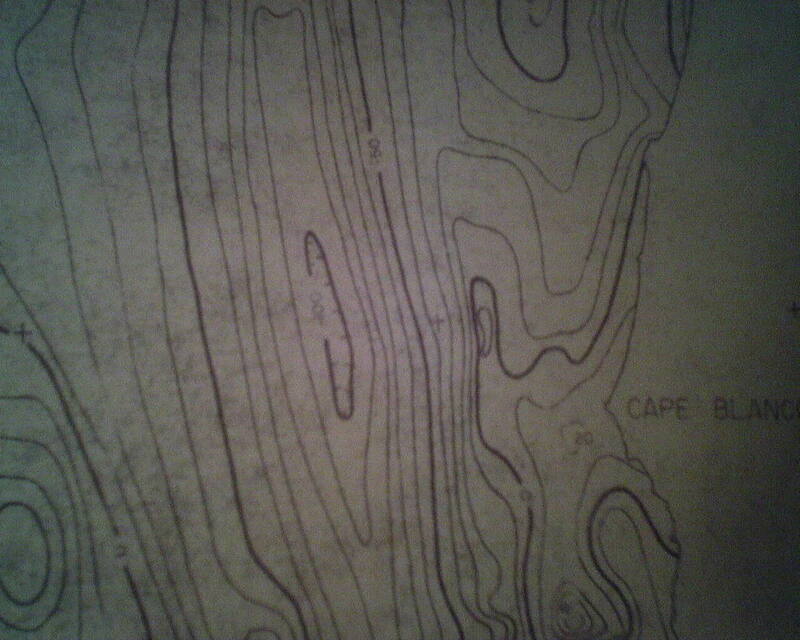 I also liked the look of a strong line at the point where two maps met, so, if the map didn’t have a printed line at the edge, I used a Sharpie to make one. 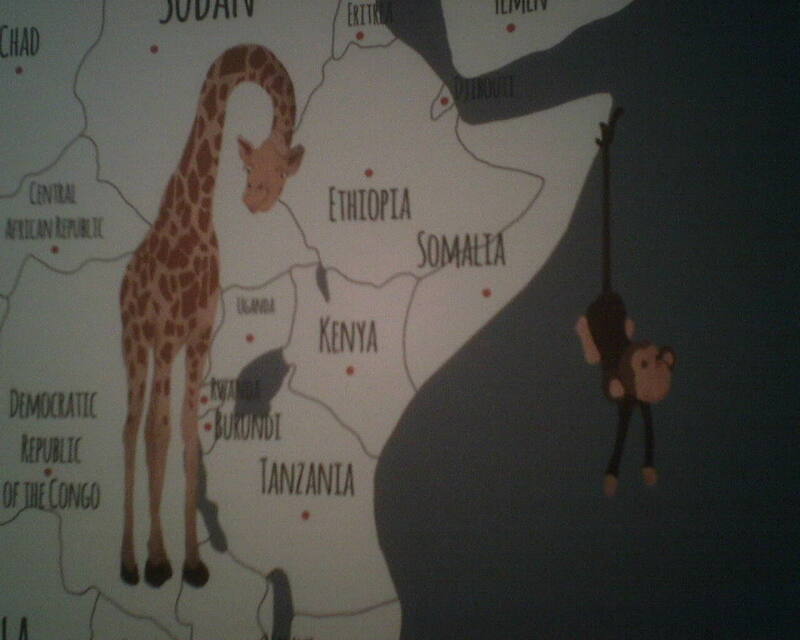 This gave a lot more definition to the edges of the maps. 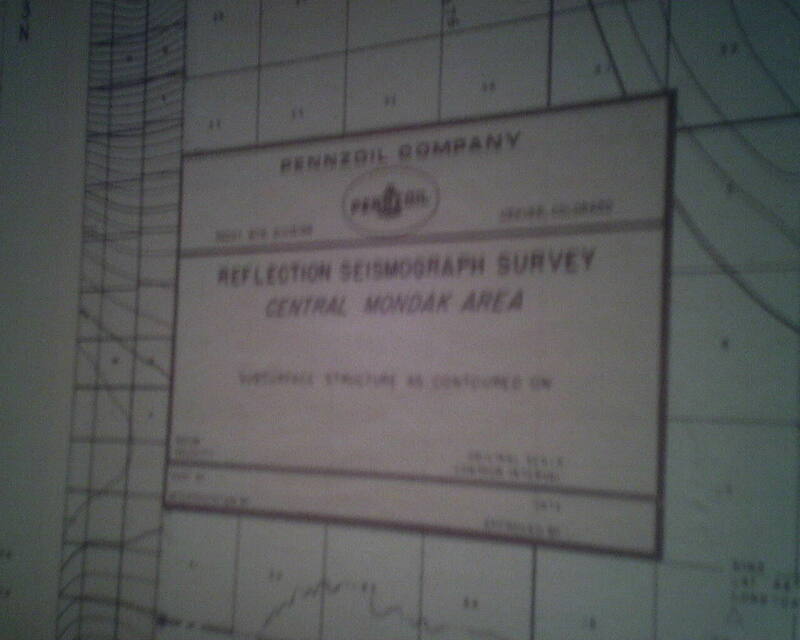 I learned the hard way that – regardless, of what they look like – lines on seismic maps are not straight, they are not parallel, and they are not perpendicular. Plus, you can plan on the paper stretching and warping. So, since I was starting from the chair rail and moving up, and I wanted specific things to run horizontally along the top of the chair rail (numbers, words, lines), it was really tricky to, at the same time, get a vertical line to run upwards equidistant from a vertical line on the adjoining map. I know that sounds complicated. It was! It’s the kind of thing that takes a lot of time and plotting and measuring and trimming, but once it’s up on the wall, all you see is “a bunch of maps – that happen to look pretty straight.” The second photo shows my table with maps, homeowners’ sticky notes, my straight edge, razor blades – and me getting ready to trim! Walls and ceilings are never plumb, and wet wallpaper likes to twist, so we paperhangers like to say that what’s at eye level is most important. 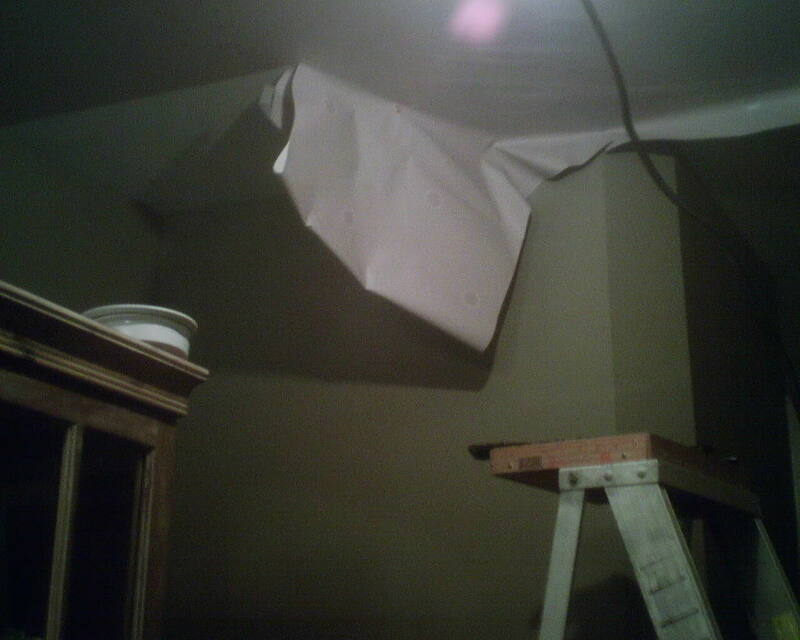 Usually, I start hanging paper at the ceiling. But in this room, with it’s paneling hitting the wall at nearly 5,’ that’s pretty close to eye level, so that became the focal point. 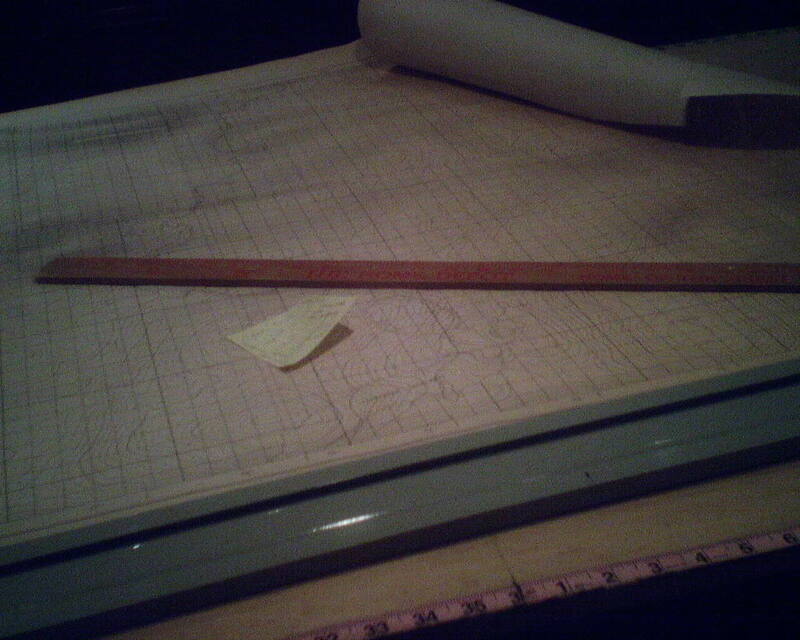 Meaning, I plotted the design at the bottom edge of the paper to line up with the top of the wainscoting. This looks great, but it’s awkward to position, because, while gravity works with you when you are dropping a strip of wallpaper from the ceiling downward, it is definitely working against you when you are trying to work from the bottom upward. The most difficult sheets to maneuver were the largest, which were about 40″ wide by 30″ high. I really thought that I wanted to use a wheat or cellulose paste with this material. These are both used less commonly, and come as a dry powder that needs to be mixed with water. 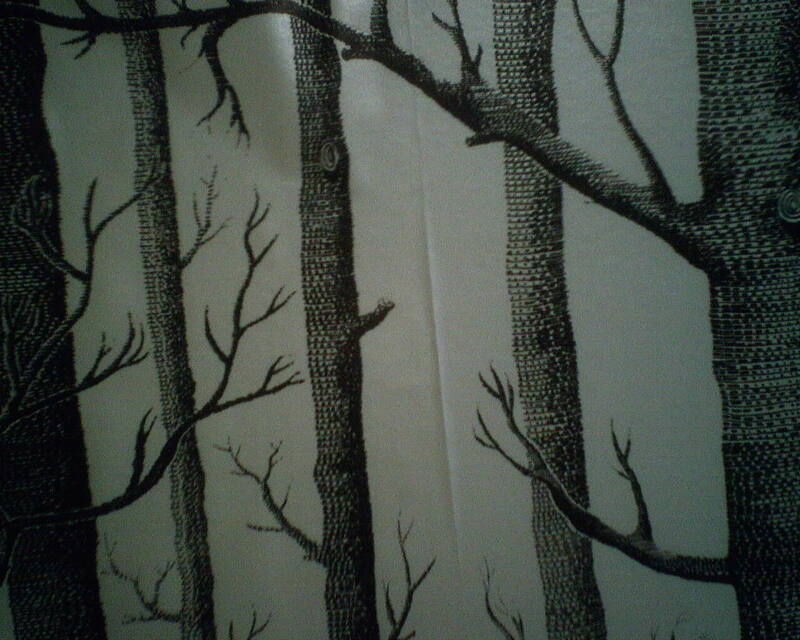 Wheat paste is what wallpaper was hung with decades, and even hundreds, of years ago. It hydrates the paper nicely, is slippery, and does not create much tension between surfaces when you unbook the paper. But when I did my tests, I found that my usual pre-mixed vinyl adhesive, diluted, worked very nicely. What worked best for these maps was to lightly sponge the back with water, then roll on a light coat of paste, which I diluted by sprinkling on a tiny bit more water as I spread the paste across the back. I was pleased that the paper didn’t tear when I unbooked it (“booking” means folding the pasted sides together, and letting it sit a few minutes to relax, absorb paste, expand, etc.). But it didn’t like being unbooked and I didn’t like wrestling with it, so, except for the largest pieces, I tried to keep the paper flat and unfolded. 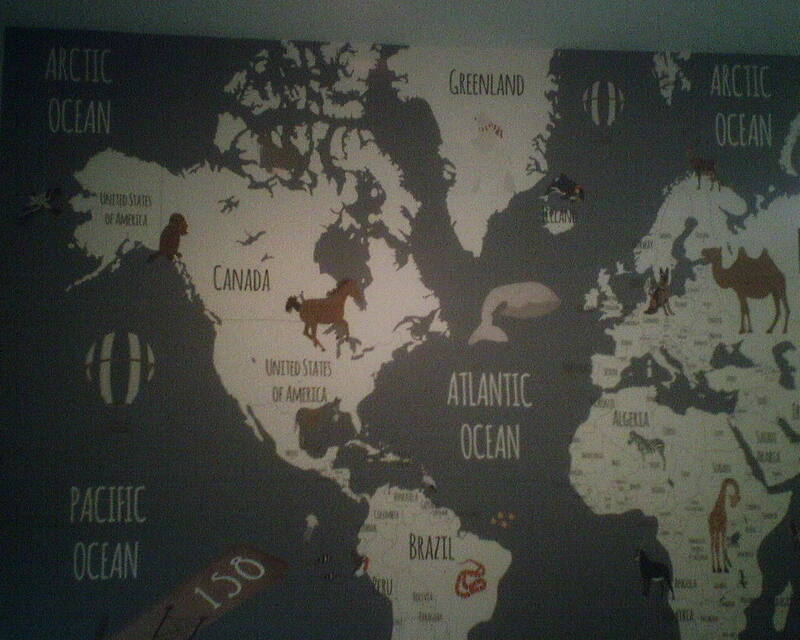 The maps didn’t dry out like real wallpaper tends to do, so leaving it open and unbooked was not a problem. The maps also responded quickly to the moisture of the paste – or perhaps it was the light sponging with water before pasting that helped. But I found that the material did not need to sit or book for much time at all. This meant that I could move along a little more quickly. And it also meant that, as long as I brushed carefully and in the right directions, there were no wrinkles or bubbles. 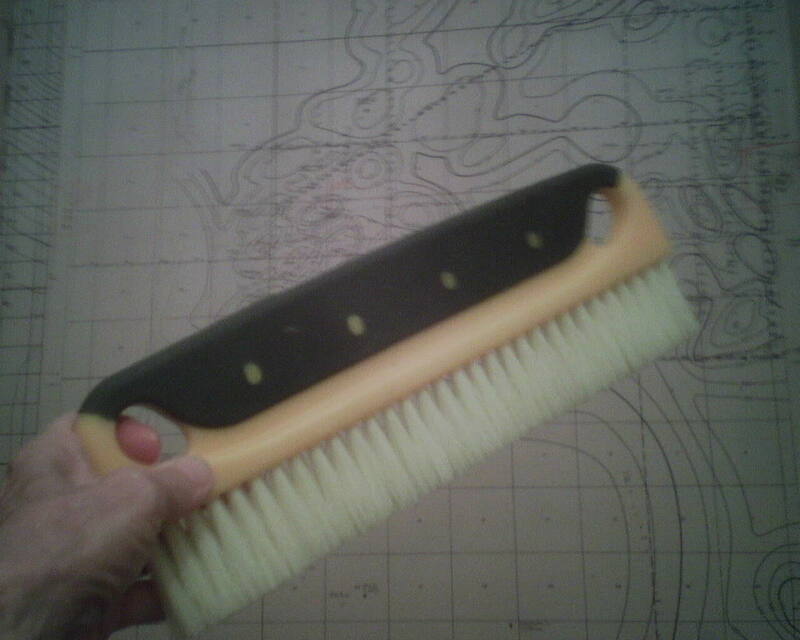 Usually I use smoothing brush with short, stiff bristles. But on this paper, a more delicate, longer bristled brush was better. I used a plastic trapezoid smoother, too, especially on the edges. When the material was wet, it was a little difficult to trim, because it wanted to drag and tear. But a very sharp razor blade, and either a lot of pressure or a very light hand, depending on the situation, resulted in nice, clean trim lines. I chose to overlap the seams. I wanted to avoid double cutting, because the process of double-cutting (splicing) seams can be hard on delicate paper (tears, stretching, stress on the wall). And the paper was thin enough that overlaps would not show much at all. See that bull’s eye in the second-to-last photo? The homeowners tell me that is very exciting to oil-patch people. It designates the highest point, and thus the exact spot where oil is to be found. Logos like that in the last photo were also important to the homeowners. 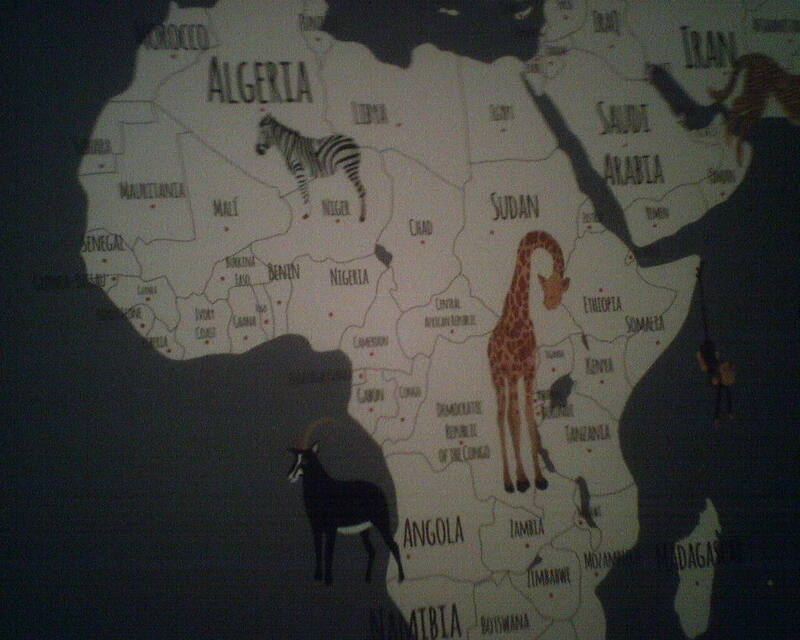 I positioned some in key areas of the room. 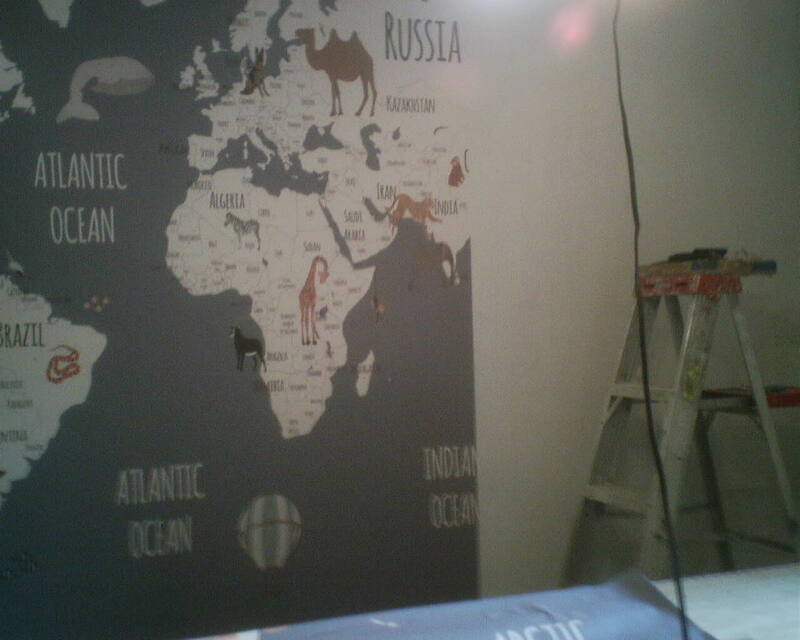 And, when I could not make that work with the walls’ dimensions, I improvised by cutting the logo off and pasting it over a different part of the map. 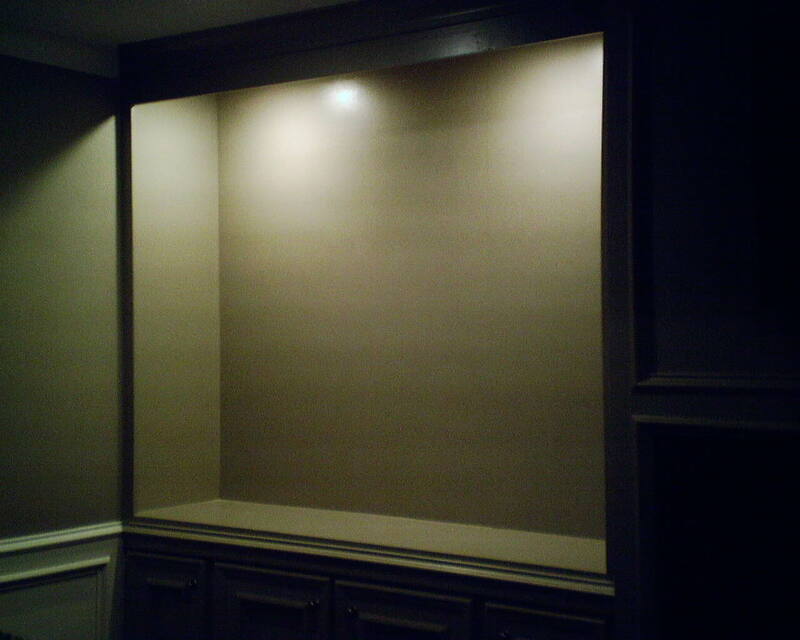 Although the job was tedious, in both the plotting and the installing, it went very well, and the clients were thrilled with the finished room. 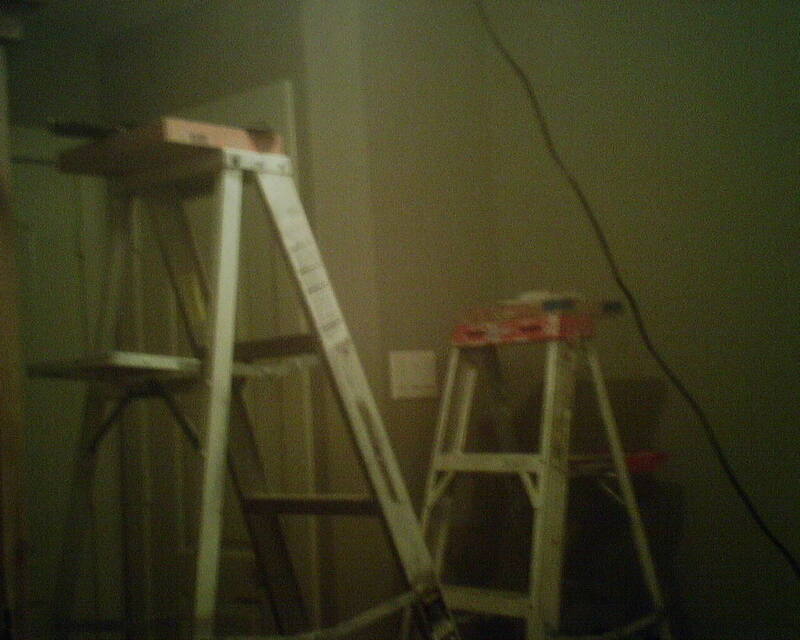 I’ll put my 5′ and my 6′ ladders next to each other, so I can smooth paper onto a section of ceiling, and then walk from one ladder to the other, positioning and smoothing more paper as I go. Another big help is booking the wallpaper in accordion pleats of about 2′ each (instead of the 1/3 / 2/3 fold that is common for paper to be hung on a wall). In the second photo, you can see me unbooking paper that has been folded like an accordion, and then positioning it on the ceiling. So a good trick is to use push-pins to hold the booked paper in place, until you have moved your ladder and are ready to unfold the paper and work with your brush and smoother to get it into place. The push pins will leave holes, true, but they can be minimized. So be sure to put the pins into an element of the pattern design, rather than into “blank” space. 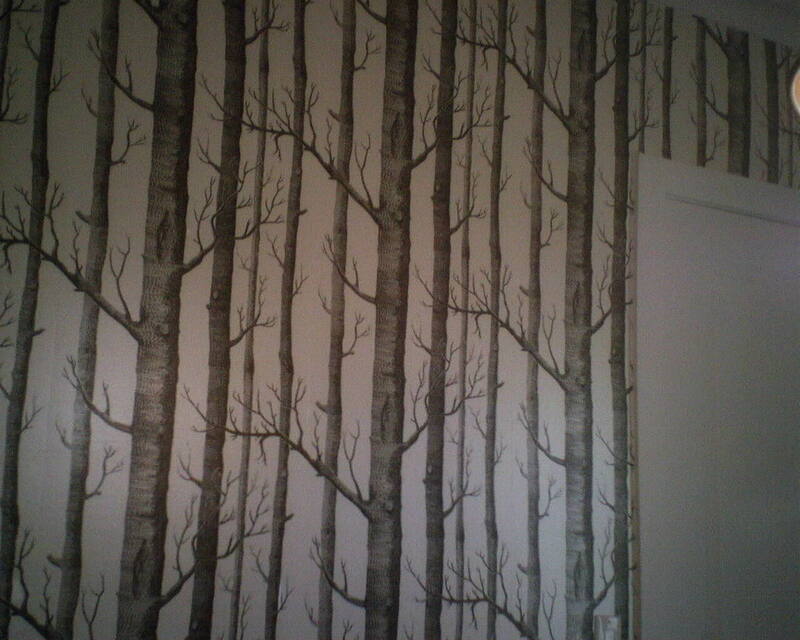 Pre-pasted wallpapers can be vinyl, paper, or non-woven. 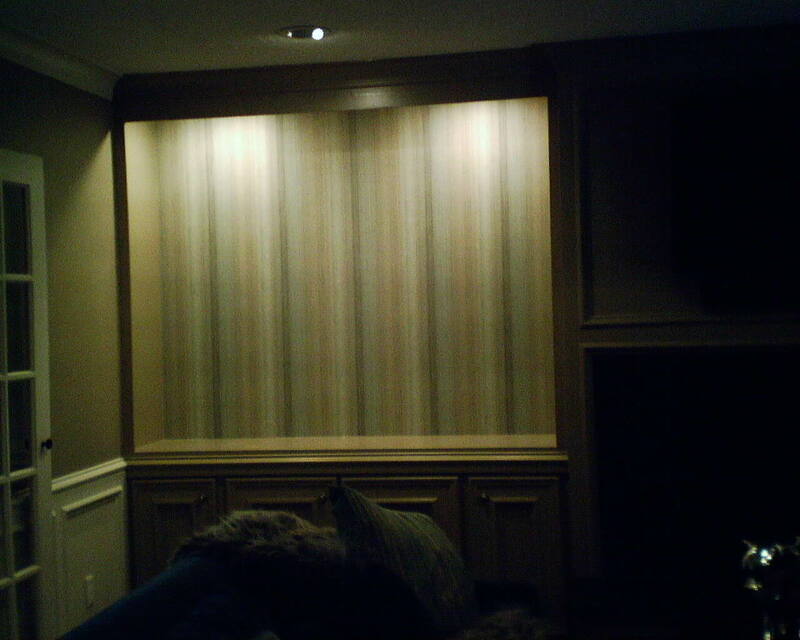 This particular wallpaper is comprised of a layer of solid vinyl bonded to a yellowy-brown paper backing, and is pre-pasted. This means that a thin layer of dry paste has been embedded onto the back, so all you have to do is dip it in water to activate the paste. Most of my friends snicker at this method, believing it to be amateur and DIY-ish. 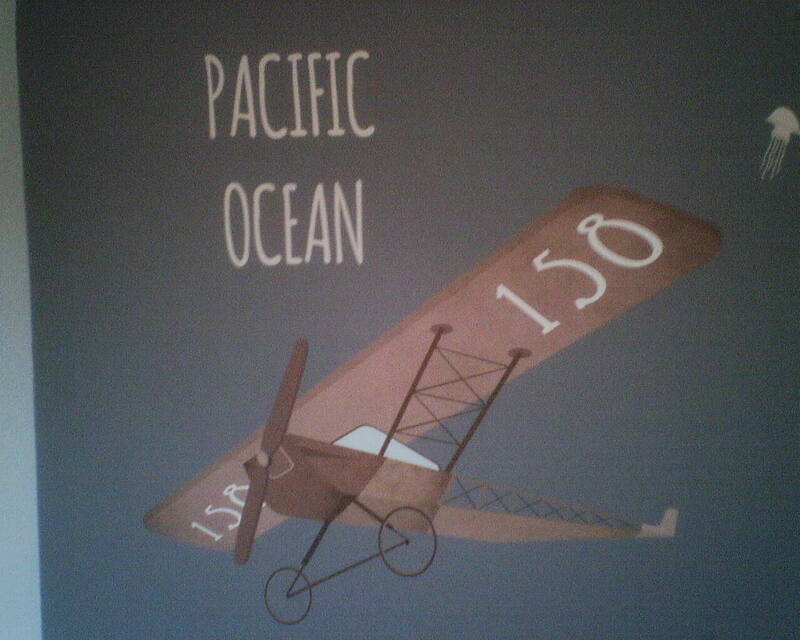 I, however, really like most pre-pasted wallpapers, and find them much quicker to hang, and sometimes I can even get away with rolling the paper out on the floor, instead of lugging in my big, loppy pasting table. In the photo, you see my green trough filled with water, sitting on towels, on top of plastic. 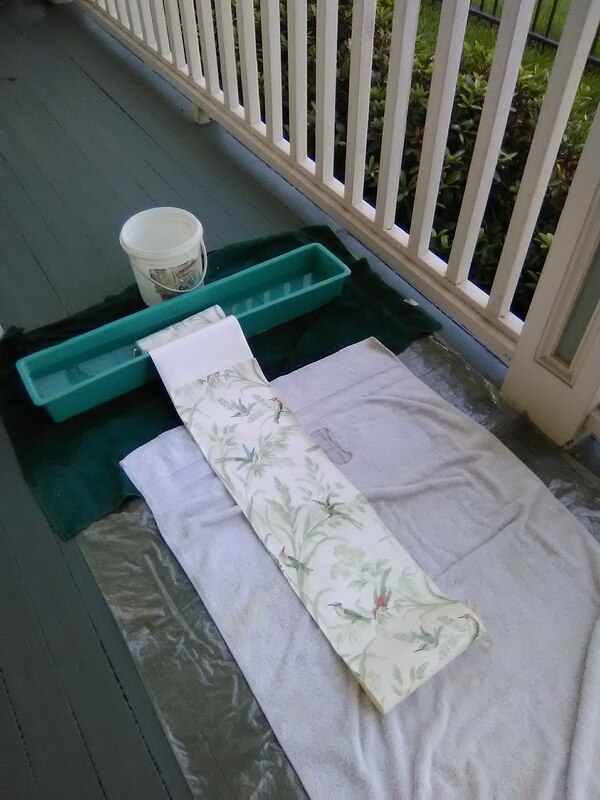 A strip of wallpaper has been cut to the appropriate length, rolled up, and has been inserted into the water. 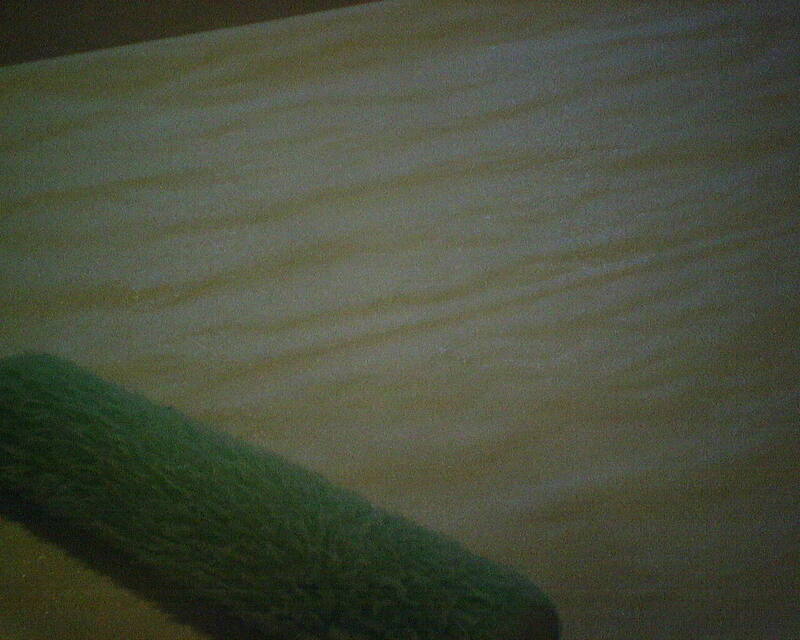 As the strip is unrolled, the backing is exposed to the water, activating the paste. 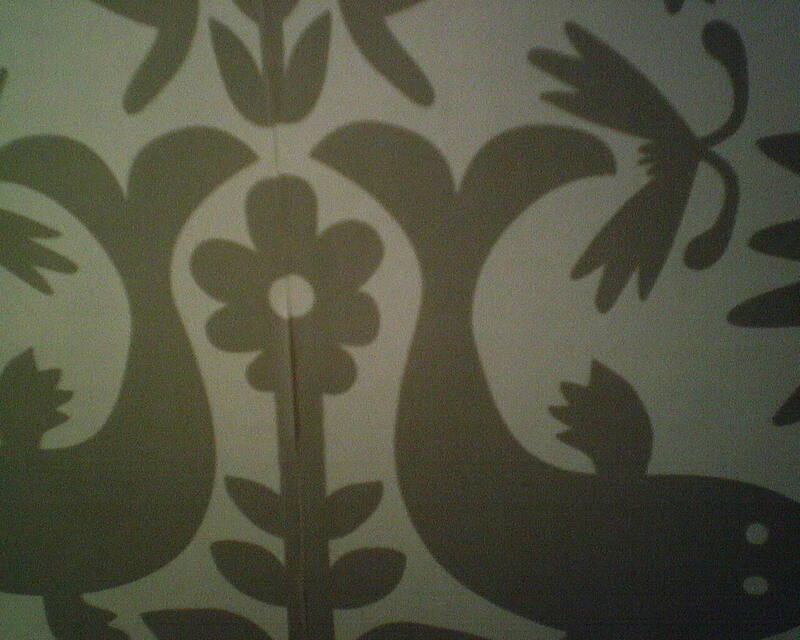 Near the bottom of the photo, part of the wet wallpaper has been loosely folded onto itself, pasted-side-to-pasted side. This is called booking. Way to the left of the photo is a strip that has been completely pasted and booked, and is now sitting for a few minutes before being taken to the wall. 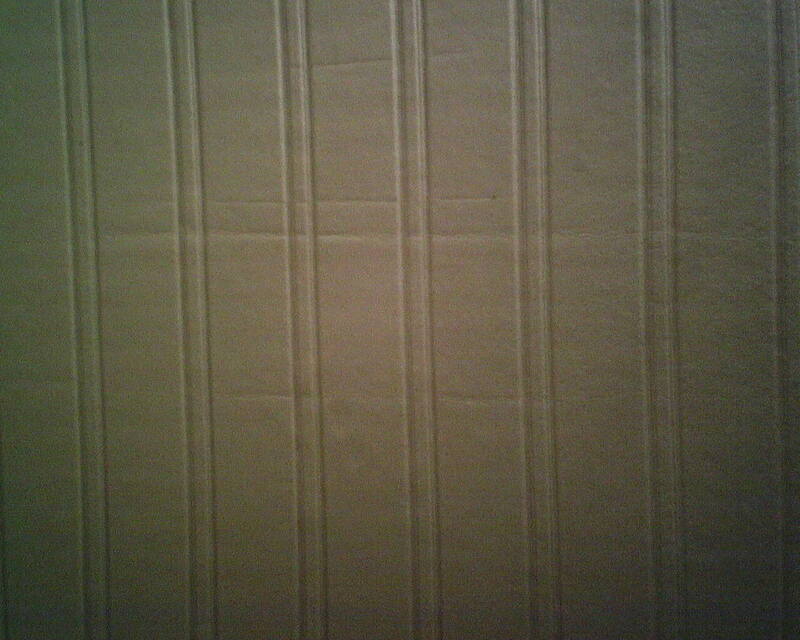 This waiting period is an important step, because it allows all the paste to become activated equally, it allows all the paper backing to absorb water and expand to a uniform width, excess water can run off, bubbling on the wall is minimized, it makes the wet, sticky, slippery material much easier to handle, as well as other benefits. When working with pre-pasted papers, I usually run a little bit of paste around the corners, baseboards, and ceiling line, and roll a very light coat of paste onto the wall, particularly where the seams will hit, to augment the manufacturer’s paste already on the back of the paper. 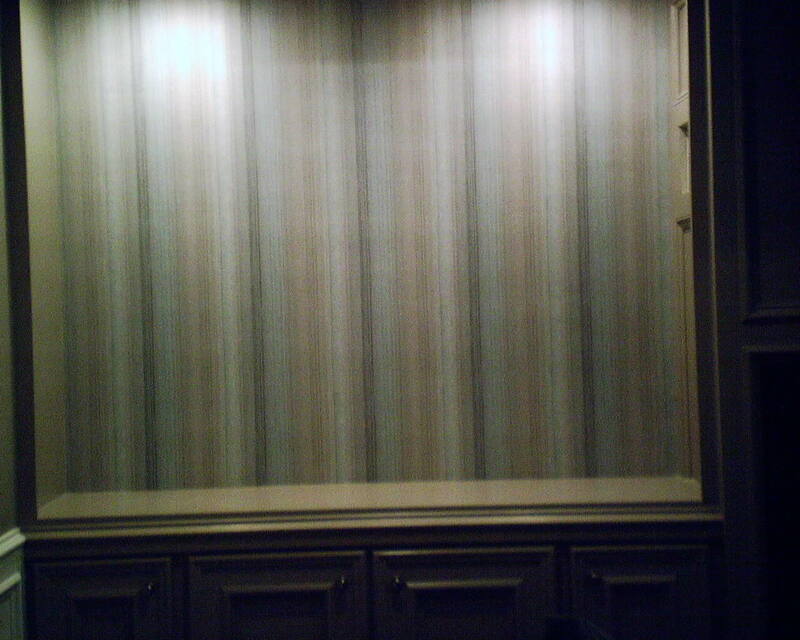 Once the booked strip has sat for the right length of time, it is taken to the wall, the top portion is unbooked, positioned, smoothed, trimmed, and then ditto with the lower portion. I find the whole process much faster than when you have to paste each strip on the table, and everything else about the installation (adhesion, workability, slip, expansion/shrinking, strength, etc.) is about the same as with hand-pasted papers. 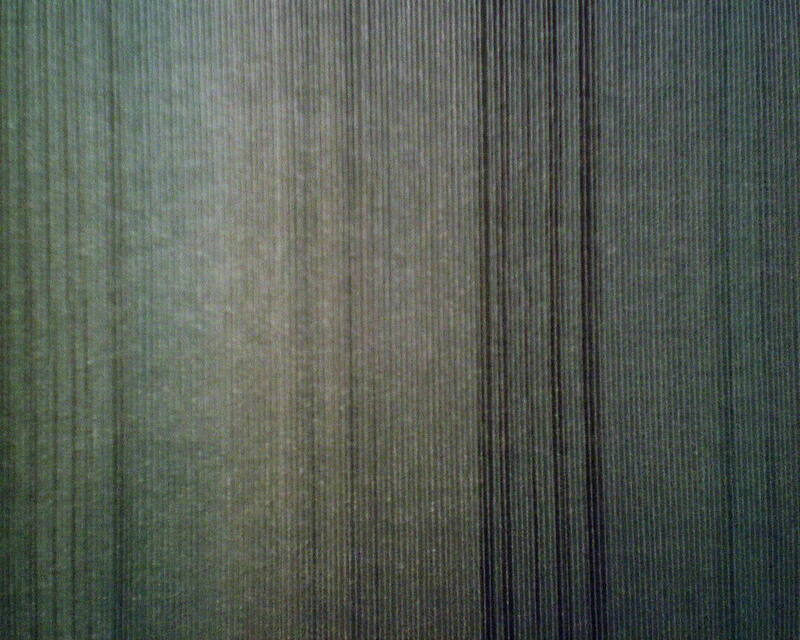 The first photograph is showing the back of a strip of wallpaper, after paste has been applied. It is wrinkled and warped. The reason is because the substrate is absorbing moisture from the paste and expanding at a different rate from that of the ink on the front, so the two materials are fighting one another. This makes it difficult to work with on my table. But the real hassle is when the paper is on the wall, and the seams curl in areas where ink crosses the seam (second photo). It was very difficult to get the seams to stay down. Often, if you wait until the paper is dry, they will dry taut and flat. But you can never count on that, so it’s best to make sure the seams are closed and tight while you’re still working. But overworking the seams can cause visible burnishing or other damage to the surface. 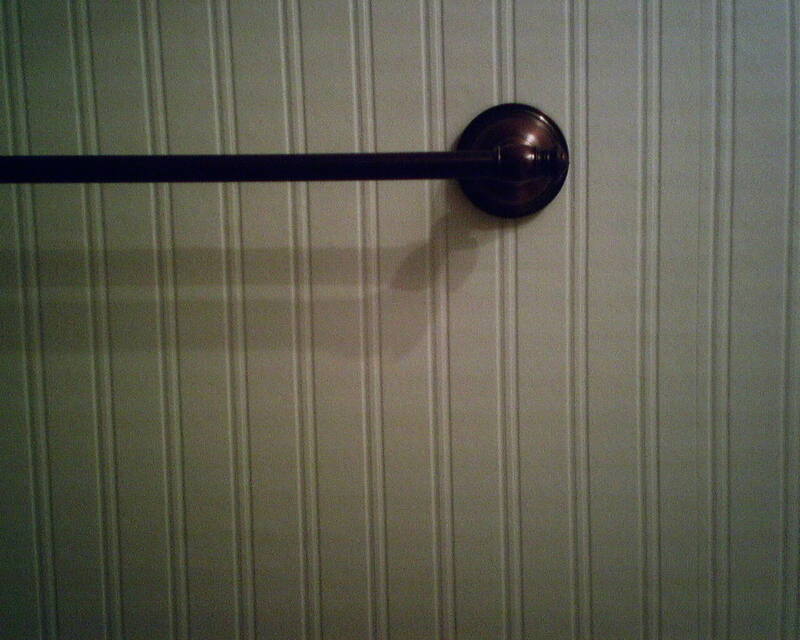 I experimented with booking times, humidity control during booking, smoothing techniques, and I used my trapezoidal smoother tool to push the cantankerous areas tight to the wall. Still, I was not 100% happy with the way most of the seams looked. Wow, I have not hung string cloth in at least a decade! It is a paper-backed product with actual string fibers on the surface. That’s why there is a somewhat fuzzy aspect to the look. Here you see the bookshelves primed and waiting for paper, and then the finished job. I took care to place the darkest stripe in the center. There is an interesting story with this job, and a good lesson to me. 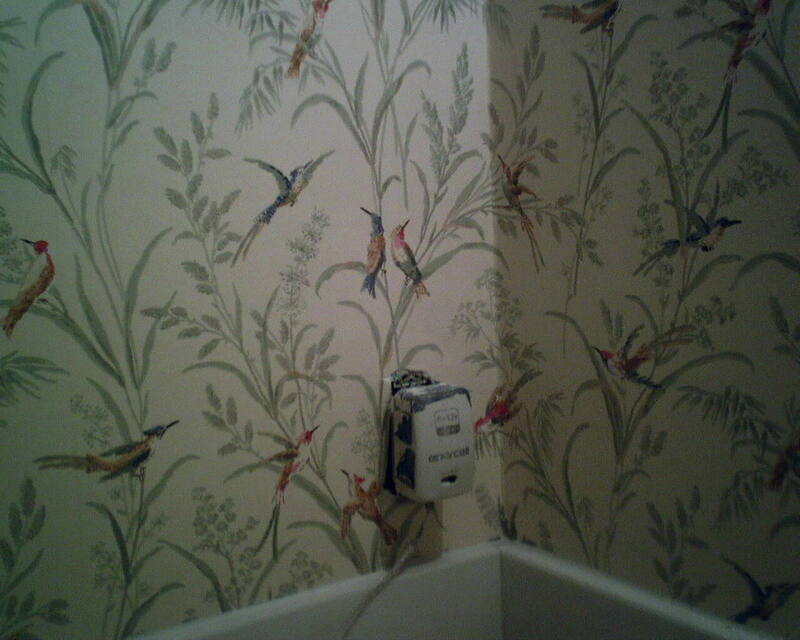 I had just finished hanging the coordinating wallpaper in the adjoining exercise room. 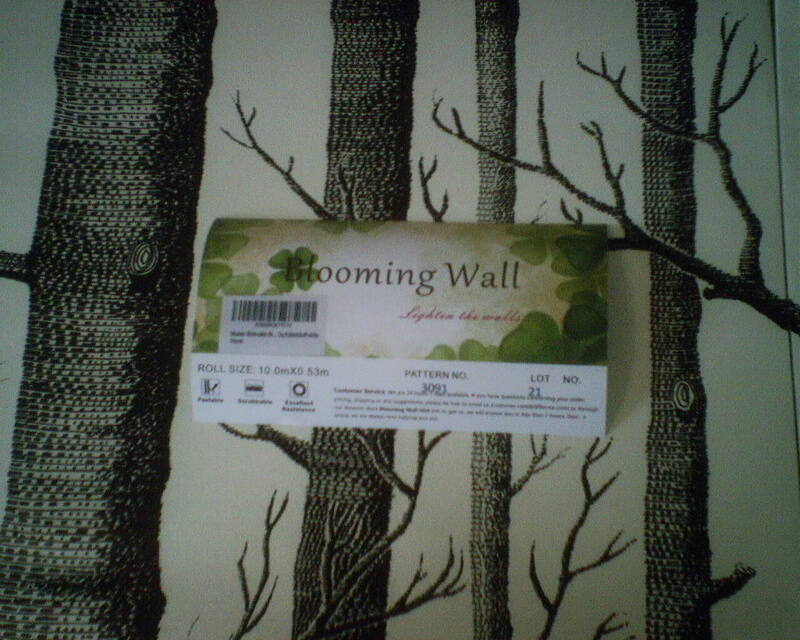 That paper was a paste-the-wall product on a non-woven backing. 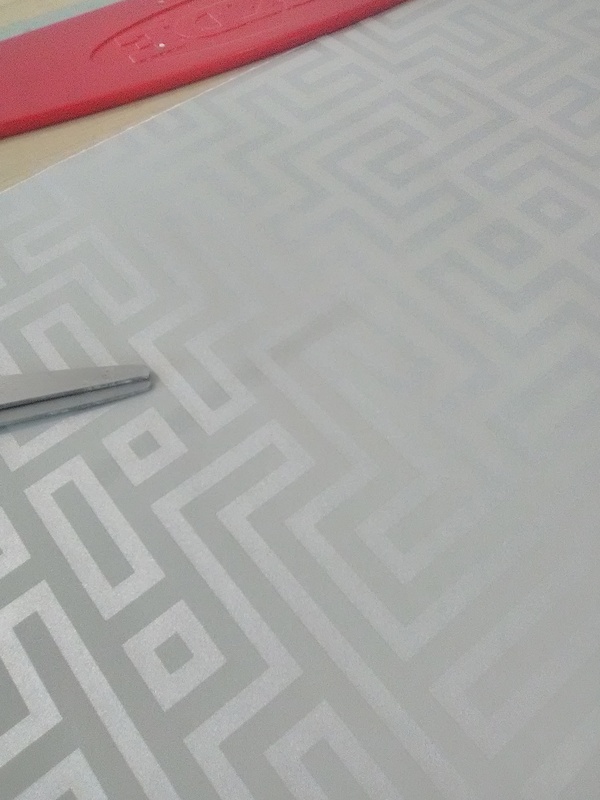 I started to work with the striped paper, and assumed it was the same material. 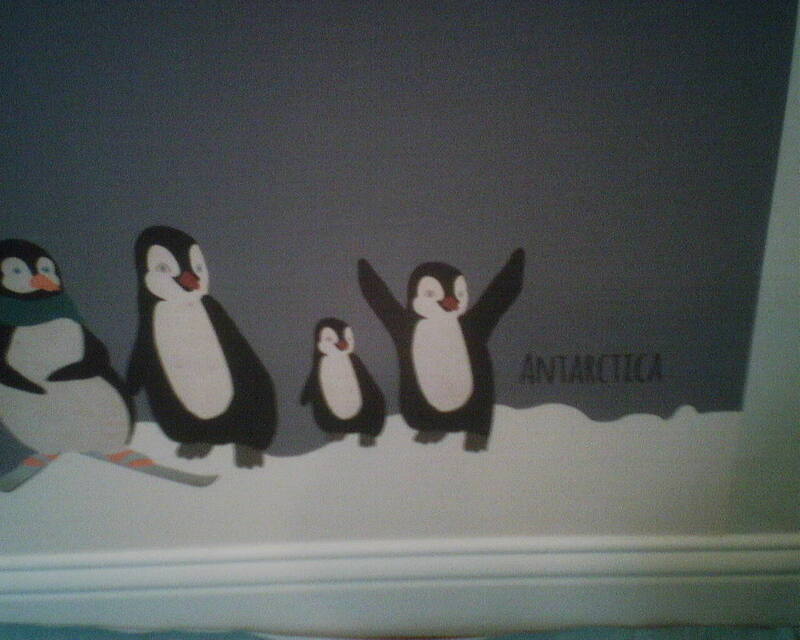 I had the first bookshelf done, three strips, and noticed bubbles in the wallpaper and puckering at the seams. I could “chase” these out – but they kept coming back. 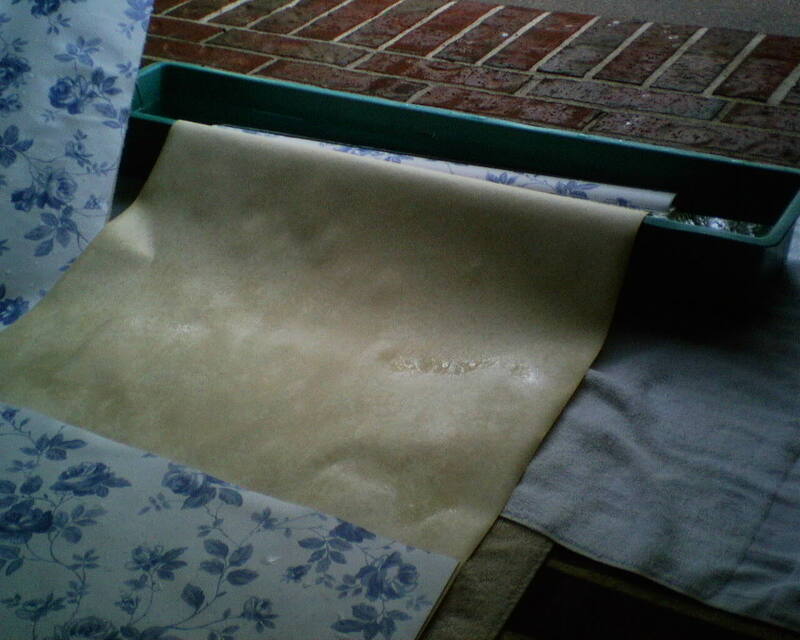 Puckering and bubbling are usually caused by the paper absorbing moisture from the paste, and does not happen with non-woven materials (not usually, anyway – I have had it happen). So I dug around and found the instructions. 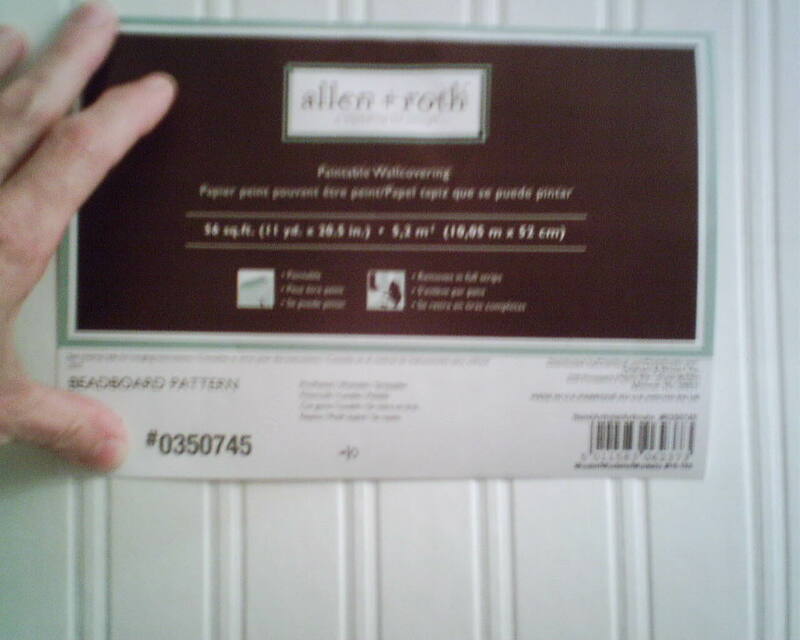 Turns out, this pattern, even though it was a companion to the one I had just finished hanging, and was the same color and printed on seemingly the same substrate, this one was specified to have the paper pasted (not paste the wall). And, they recommended a 10-minute booking (relaxing) time, to allow the paper to absorb the paste, expand, and relax. 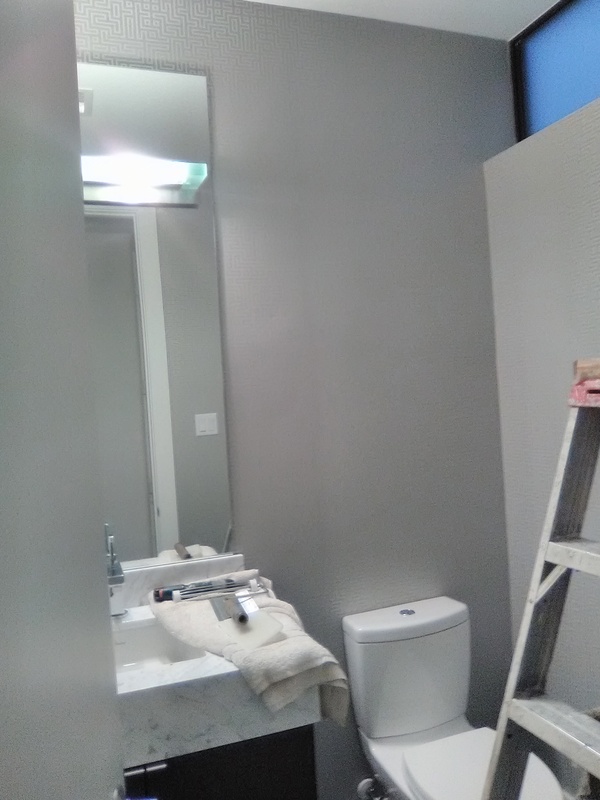 Because I had a good primer (Gardz) under the paper, I was able to pull off the strips without damage to the wall. And because it was printed on the non-woven substrate, and had not gotten completely dry, the paper came off in one piece, totally intact. I didn’t have time to haul in and set up my table, so I laid down some drop clothes on the floor, spread the paper out on them, rolled on paste, booked, (no need for relaxing time, since the paper had already had time to absorb moisture and expand), and then hung the paper. Whew! It as a bit of a mad dash, but it was the right answer. The newly pasted and hung strips went up perfectly, no bubbles, and the seams were nice and flat. The paper did stretch a little bit, though, horizontally, but not vertically, so I had to trim a little off one side, and it did throw off my placement of the center stripe in one of the bookcases, but, in the end, it looked great. 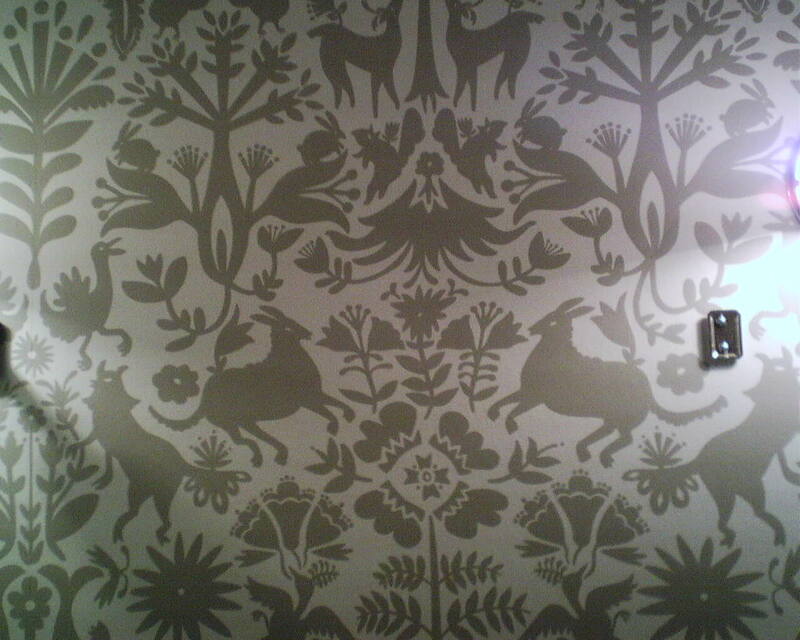 This wallpaper design is by Carl Robinson, made by Wallquest which is made for Seabrook, and was hung in a family room in a house in Bunker Hill Village.